This guide shows you how to install Windows with Universal USB Installer! For those who like to experiment with different Linux-based operating systems or install Windows 10, buying DVDs for burning ISO images is bit of a hassle. This is the case whether you want to simply install or use the Live boot portion for a test drive of a new OS. This tends to be both a waste of time and money, because discs are slow compared to other media. In such times Universal USB installer saves the day, by writing ISO files of popular Linux distributions to a USB drive for booting and installation. It also works well for installing Windows Vista, 7 and 8 via USB. Universal USB installer is a user-friendly application allowing you to run a live Linux distribution from portable USB flash drive. Though one cannot suggest Linux for beginners but Universal USB installer comes with rather easy-to-use approach. UUI is also particularly useful for “starting all over again” after Windows has suffered a fatal crash. The Universal USB installer is a program that allows you to easily create a bootable USB thumb drive. More specifically, UUI is just an app that was designed specifically to install a new operating system. This is useful for installing both Windows and for installing Linux ISOs. Use this process to create a bootable Linux drive; this process works very well with Windows, too. To quickly use UUI, select “Live Linux Distribution”, “ISO file”, and your flash drive letter. In order to install Windows using Universal USB installer, you need to have ISO Windows Vista, 7 or 8 image file. It does not support XP (officially). The entire process of installing windows using Universal USB installer is available as a wizard. The process is very easy to use and requires you to follow certain steps. Download the Universal USB installer on your desktop, double click the icon, then select run. After you have successfully completed the process, your ready-to-run bootable USB flash drive is now done. After you have installed Universal USB Installer double-click to run the program. A detailed text of terms and conditions shall appear requiring you to tick the box wit I agree. Next, browse to your Windows ISO image file (image file means “disc image” – not a “photo” image). For this, you need to create a Windows 8 bootable drive (continue reading). Now select the letter of your USB thumb drive. Go to My Computer to see the drive letter of your thumb drive. Then return back to the application. Don’t forget to mark the box saying format drive. Click CREATE and a dialogue box shall appear and you need to press Yes. The process to begin extracting and copying the contents of the ISO now starts. Click DONE after the process is completed. You are ready to run Windows for the first time! Just wait for a little while and you shall see for yourself that it barely takes less than 5 minutes time to complete this process. Universal USB Installer does a good job and is quite effective for Installing Windows using a flash drive. 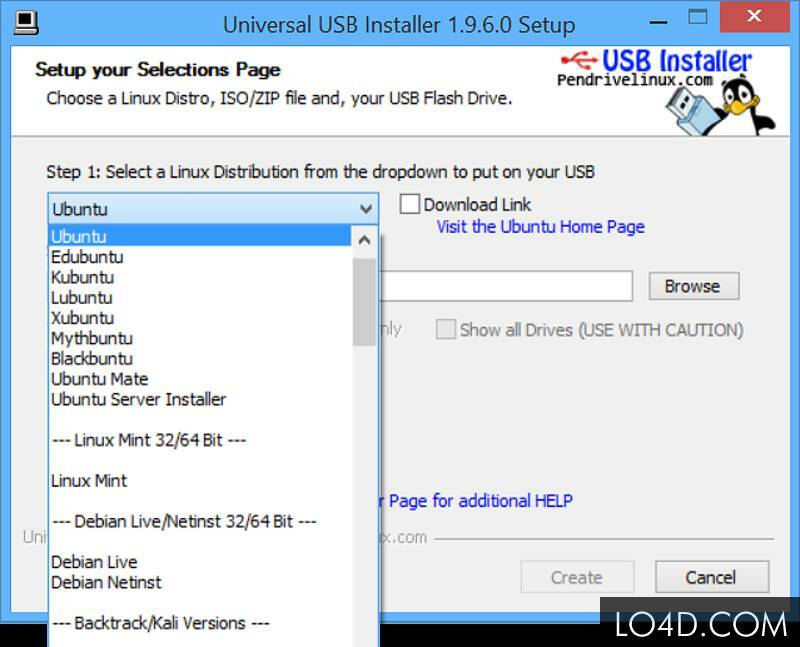 Universal USB installer is quick and easy to use and comes with numerous supported Linux distributions as well.